I just spent a magical few days in and around The Isle of Avalon which I find incredibly peaceful, inspiring and magical. I used to go to Glastonbury festival in the early 90′s, then a decade later I was introduced to a wonderful Shaman in Glastonbury town and received a ‘Higher Perception Reading’ which completely blew my mind, gave me a definite direction and changed my perception of life …… and beyond! I was intrigued with Shamanism and decided to do a Shamanic Healing course at the Isle of Avalon Foundation for my own development and growth. I didn’t plan on offering Shamanic Healing to clients but I decided to do the case studies anyway to get the qualification. During this time, I received amazing results and feedback so I decided to incorporate everything I learned (regression, cord cutting, soul retrieval, sound healing and now higher perception readings) into my business. Now, when I return to the area I have so many wonderful memories that even without attending college I feel like deep learnings and healings are integrated into my being just by being present there, especially as I’ve recently discovered that the heart chakra of the planet is in this area! One of the places we visited during the course was a beautiful nature reserve in Compton Dundon near Glastonbury town. It is said that the veil between the worlds is very thin here so it’s a wonderful place to heal and strengthen our connection with our ancestors. Whenever I visit Compton Dundon I always have a very special, magical and enlightening time and I come away with amazing insights and learnings — this time was no different! The day of the visit was synchronistically 31/10/10, Halloween which I hadn’t planned, so it felt even more special! During my stay in Glastonbury I had time to party with dear friends and although it was a short stay and I did lots I also had a very relaxing time. I didn’t have time to go to The Tor though, but when I was at Compton Dundon I went to an area I hadn’t been before and was rewarded with an amazing view of The Tor (see photo below). 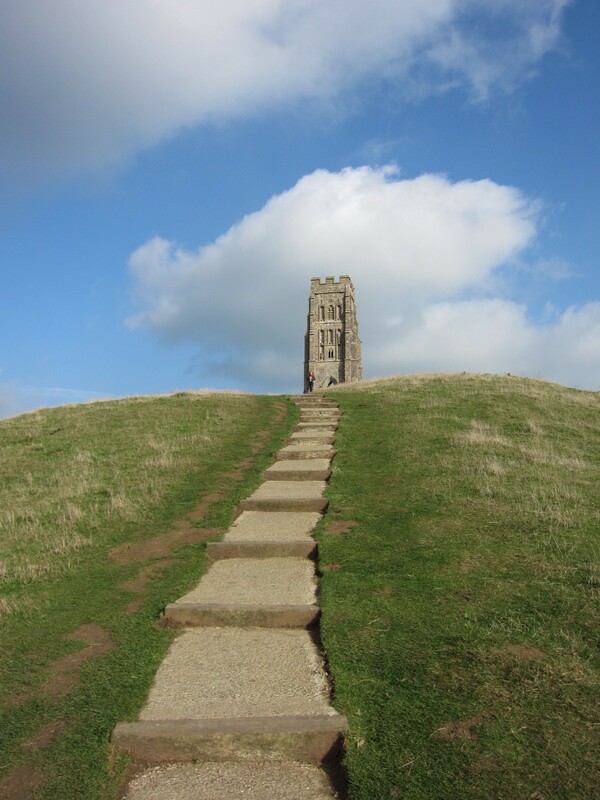 I returned home the day after the clocks changed, but I hadn’t changed the clock in my car, so magically, before I left Glastonbury I gained an hour which meant that I had time to climb The Tor. When I was there I witnessed some amazing sights including a kestrel hovering looking for its lunch and in the foreground of Glastonbury town I saw a beautiful, giant heart shape on Chalice Well Hill (see photos below). I wish you a happy month beautiful people.